This has been raised many times, however there has been no movement on this particular feature that I have found so I am raising this in the forum. I would like to obtain an estimate from the ERPNext team / foundation as to what it would cost to have this developed, and then I will create a bounty at ERPNext.org based on that estimate. The requirement is to have the facility to add / remove / edit the tax applied per line item in any Sales / Purchase related doctypes i.e. Quotations / Orders / Invoices. At present, we can only apply the tax to the document, meaning every item within will have those taxes applied. To override those applied taxes to items within, we then need to add the applicable taxes in against the item master. This is painful and timeconsuming when having to constantly revert back to item masters to update values. It also introduces integrity issues if users make a one-off change to suit one transaction and forget to change back. Further, and more to the point, this does not allow the flexibility of having multiple of the same items with different taxes applied. I place a Purchase Order for goods, 5x Computer and 5x Autocad. 4x of each will be on sold to clients, so the default tax will be used - ‘Tax - A’. The remaining 1x of each will be purchased for the company, and so will need a different tax applied - ‘Tax - Y’. To get around the above, we need to create two separate orders or invoices and specify the different taxes. 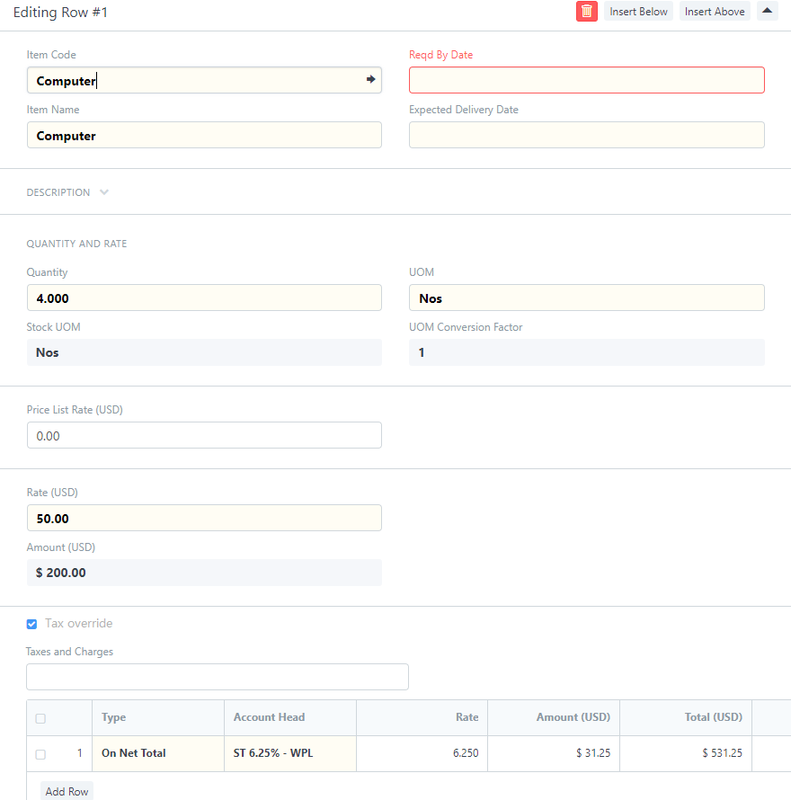 I have had multiple instances where we needed to have several invoices created in ERPNext for one received from a supplier. As to what the override would be, this needs to be discussed and confirmed to work for varying regions. Initial thoughts would be to have an override button within the line item which stops all taxes applied from the document / item master and you can then specify as required - something like below although I am not certain of ramifications of having child table within child table. Looking for input from the community and also backers for this as I know I am not alone. @JoEz apologies for the delay. In the example above, there were 4x Computers and 4x Autocad purchased to be on sold to customers and so are allocated as Cost of Goods Sold - these are allocated to one tax classification. The other 1x Computer and Autocad were purchased as expenses to the company to be used internally - these are allocated to a different tax classification given they are a capital expense. This is only a basic example when using the same items on multiple lines. This may need to be done in cases where bulk purchase is required for a particular price point (in our client’s case). As a different example not using the same item multiple times. A separate example is the purchase of a vehicle. The invoice has several line items. Vehicle (Capital Expense which includes tax - Tax A). This is an item / fixed asset. Stamp Duty (tax free - Tax D). Entered without item code. Registration Fee (Non-capital expense without tax - Tax B). Entered without item code. Compulsory Insurance (Non-capital expense without tax - Tax B). Entered without item code. Number Plate (Non-capital expense without tax - Tax B). Entered without item code. Extended warranty (Non-Capital expense with Tax - Tax C). Entered without item code. I realise this is more to how it is entered into ERPNext, as when entering these into the Purchase invoice we do not use item codes, but simply populate the item name / expense account for each line item - like @becht_robert suggested at Expenses not related to items. In any case, all of the accounting packages I have used all have the ability to change the tax implied to individual line items in the sale / purchase document i.e. Xero, Quickbooks / Reckon, MYOB.